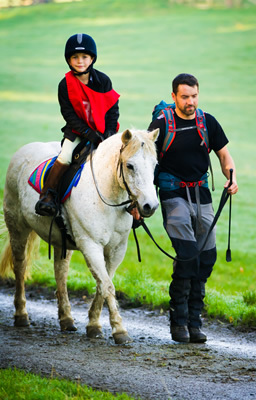 When you first start out in endurance it can seem like there is not much information out there, either for the beginner or those aspiring to go further, faster. In fact, there is plenty of information if you know where to find it. Perhaps the best source is the many other people you'll meet at rides who will all be very happy to talk about their sport and pass on what they have learnt along the way. However, there is also a plethora of information on the internet. Beth Langley's blog: a really interesting blog by one of Britain's best young riders. Nikki Routledge's website: another site from one of our top riders, this one is particularly informative about training and many newcomers to endurance have used it as the basis for their own training, with good results. The following sites are written by American endurance riders, there is also a lot that can we can learn from them! distanceriding.org has some great articles of interest to the endurance rider, covering topics such as feeding, sports psychology and terrain. The Barb Wire is a blog by an rider/trainer of Barb endurance horses. One particular entry (click here) has dozens of links to fascinating articles, mostly related to fitness. It can be a brilliant springboard to further reading.